There are so many kind, generous, and talented people that want to make a difference in someone's life. A life that may be difficult, discouraging, painful or unfair. We were able to meet a few people that put smiles on kids faces. Kids fighting a serious illness or living with a disability. Kids like Hailey. When I saw that Peach's Neet Feet would be coming to Las Vegas and joining Zappos.com for a carnival to celebrate others, I knew I wanted Hailey to be a part of it. Being kind is Hailey. I've blogged about it before, but it really does amaze me that Hailey loves others. She doesn't care what you look like, if you are in a wheelchair, or how old you are. Hailey will gladly say hello to you with a big smile. Peach’s Neet Feet is a random acts of kindness based, non-profit organization that provides custom, hand-painted shoes to children living with disabilities and fighting serious illnesses. I filled out an application for Hailey and then later I had found out that Hailey will be presented with her shoes at the event. We actually had a cardiology appointment in Utah that SAME day! We headed down to Utah the night before, had our appointment, placed Hailey's Holter Monitor, and booked it back in time for the carnival. Once we got there we met Peach and she told Hailey that she wanted her to meet someone special. That someone special was the artist that painted Hailey's shoes, Alissa. When Alissa pulled out Pink Converse shoes that had Anna, Elsa, and Olaf painted on it there was this HUGE smile that came to Hailey's face! Hailey couldn't wait to get those shoes on her feet. Well...over her AFO's! LOL! Peach and Alissa both helped Hailey put on her new Frozen shoes! Hailey was so excited for this gift and I was so Thankful to Alissa, Peach, and the Mayo family (who donated the shoes to be painted) for the smile on Hailey's face. Hailey gives hugs all the time, but she really embraced Alissa with love for sharing her talent and giving Hailey something so personal. I LOVE this photo!! Here is a close up of Hailey's shoes. Aren't they amazing?! So much detail on such a small space. Alissa is a truly talented artist. She even incorporated the blue Leukodystrophy awareness ribbon. To top it all off the shoes even SPARKLE!!!! I can not stop raving about these shoes! I love that Hailey gets complimented on these shoes and that we can share Peach's story with others! 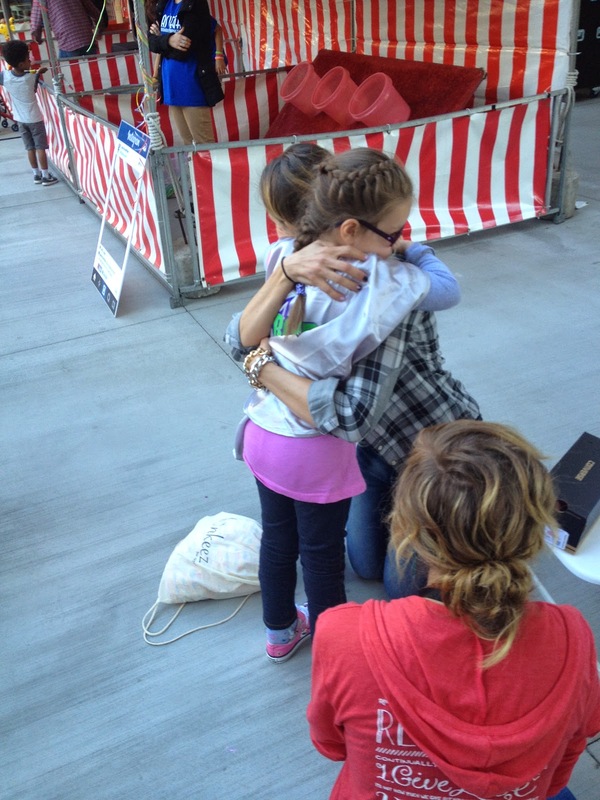 To thank Peach for the awesome job she does we gave her a Hugs for Hailey shirt that she opened at the carnival. 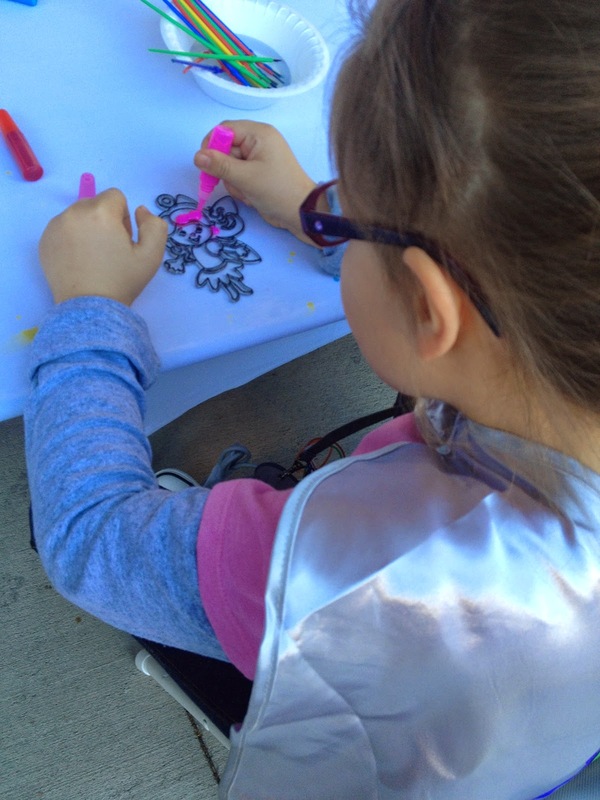 Zappos headquarters was turned into an amazing kid friendly space that included, carnival games, arts and crafts, a petting zoo, a bounce house, and lots of food and goodies! Hailey invited her cousin to come along and my sister and my mom went also. Hailey and her cousin played every carnival game with great enthusiasm! They cheered each other on! The girls are sporting capes they were given by Jill who donated a cape to each child for the event! The capes say, "Born to be Awesome!" Next station that we visited was a paint/decorate your own cookie. The cookie had a picture printed on it and you took edible markers to decorate it. Hailey found this to be something so amazing and odd. I kept saying, "Yes you ARE allowed to color on these cookies." Thank you to Wicked Good Cookies for this great activity. The cookies were SO yummy! There were also pillow cases that the kids could color and take home! We met Shannon and she was so great to help Hailey with her pillowcase! Thanks Shannon! The petting zoo was another hit with Hailey. This kid LOVES animals and this duck was Hailey's buddy following her around. There was a stained glass art station. Hailey grabbed for the pink paint first...of course! We also met the person responsible for the other half of this carnival. We got to meet Dana with Zappos and we got to thank her for being a part of this and helping with getting every kid a pair of shoes! Zappos does a whole lot for the city of Las Vegas. They are an amazing company. Dana, it was so great to meet you! We hope that we can stay in touch! THANK YOU!! Since Hailey can not do bounce houses for obvious reasons we always give her a choice. Bounce house or face painting. We know she can NOT resist a good face painting so it ALWAYS wins and she feels as if SHE is making the choice. She got a FROZEN theme face! She loved it! It was like the cotton candy was on steroids!! It was huge! I am a big fan of cotton candy. **Side note: I love cotton candy so much I had it at my wedding reception! My love for it must be genetic! My mom had a great time with the girls coloring MORE cookies! At night when we got home I told Hailey it was time for bed, and time to put on pajamas. She stuck her tongue out at me, held her legs, and told me that she was NOT taking off her Frozen shoes. She wanted to sleep with her shoes on. It took some work but I did get her ready for bed with the promise that she'd get to wear her shoes first thing in the morning. Along with all the activities that there were for the kids they also got prizes at every carnival game and a goodie bag FILLED with fun things to take home! I thought this was a pretty cute prop! All the kids got to take a photo with it! Another awesome gift given to Hailey was this blanket from Binkeez for Comfort. It is amazingly soft and perfect! Thank you Binkeez! As you can see we had the most fun time with Peach's Neet Feet and Zappos.com They did an amazing job putting this all together and opening their hearts to these kids. Hailey didn't stop smiling...(until it was time for bed) If you can or want to help any of these great organizations please do so. I've linked to the companies Facebook pages if I had them. You can always get more information on the Peach's Neet Feet website as well! If you're an artist or if you would like to purchase the shoes for a child check out her site! Thank you to ALL involved, the organizers, the volunteers, those who donated and the other families we got to meet!